All fees include Vendor Hospitality Room and Free Parking. Electricity is available on a first registered-first served basis. They already have Jewerly, Bath and Body, Scentsy, Thirty One, Grace Adele, Rodan Fields, and Stella and Dot representatives, but would like to have representatives from Tupperware and Discovery Toys. Applications are available here and are due by December 7th, 2012. 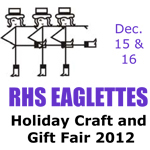 For more information, visit their website or contact their event coordinator at rhseaglettes@gmail.com. Only 10 vendor spots remain for this show, so don't delay! We need more home and kitchen items and are still hoping for Disovery Toys and Pampered Chef reps to participate. 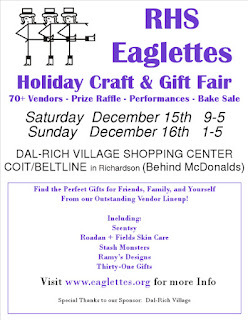 We are full for jewelry, bath & body, and quilts. Contact rhseaglettes@gmail.com for more info. How many quilters do you have signed up? There isn't one more vendor space is there? Issac, you could check with the event coordinator at the email address above (rhseaglettes@gmail.com) to see if they have had any cancellations.